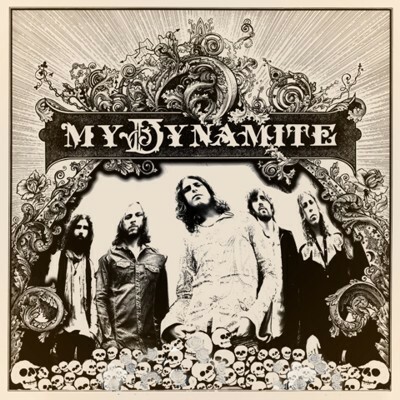 My Dynamite was a bit of an enigma to me when their unbranded CD arrived in the post. With a thirst for knowledge, I searched all the usual suspect websites and I have just about gleaned that My Dynamite is an Australian band from the Melbourne area. That and the line-up comprises Pat Carmody on vocals, Jorge Balas and Ben Wolfram on guitars, Sim Aarons on drums and Trav Fraser on bass. And before I forget, I also worked out this is a self-titled album! So with no preconceptions, I put the CD on and lo and behold I started listening to a great album. It is a very retro-70s recording and sounds as though the band recorded it live as there is a lot of ringing and bleeding from one instrument to another. The singer, Pat Carmody, is very strong and incredibly commercial and has shades of Rod Stewart (during his rock days) and a big vocal delivery resemblance to Steve Tyler. High praise indeed! As mentioned early, the production is a bit messy but that´s not necessarily a criticism. It is a lively platter with a lot of catchy guitar riffery going on, particularly on tracks such as ´If We´re Living´ and ´Watch Yourself Grow´. The band shows a bit of light and shade on a later track, ´Singing Stormy Weather´, which builds well and becomes a mini-anthem. The album does not let up and by the last track, it is clear that the band has done a good job in quality control. The last track being ´For In Your Tongue´ - a very raw and stomping blues track which slowly fades out in a mysterious way. On reflection, if you were semi-listening to one of these tracks on the radio and the DJ said it was a lost track from Aerosmith, then no one but the aficionados would be surprised. My Dynamite has come up with an album full of raucous but very commercial songs. The flip side is that there is not much depth; but if you are looking for ten four minute long catchy tracks to play in your car, look no further. 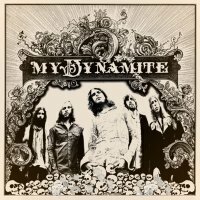 On the strength of this album and how they are clearly playing on it with full commitment, My Dynamite would be a very good band to see live. One nugget of information I learnt subsequently is that the band is doing a European tour soon; let´s hope they don´t bypass the UK.